The Iceberg Skating Palace is a very popular skating arena in Sochi, Russia. The complex opened in 2012 and has a seating capacity of 12,000 people. 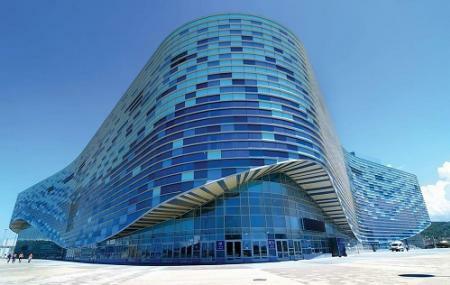 This multi-purpose arena is located inside the Sochi Olympic Park and hosts a number of skating events. Figure skating, Short track skating and Ice skating competitions are held here. The sports complex is famous for its structure, the construction of which cost $43.9 million and utilized 15,000 tons of steel. This spectacular Skating Palace is worth a visit. Use Adler trip planner to visit Iceberg Skating Palace (adler) and many others to your visit. Hotels like Kiparis Hotel, Atlant Hotel, Hotel Edem and Hotel Prichal will solve your problem of where to stay in Adler. Curated Adler vacation packages await! Book the best ones and start turning your dream into reality.Discover various ways for how to reach Adler and complete the booking by choosing your mode of transport. By Taxi: Share taxi: 124s to stop- Bar "Terassa"
By Bus: Buses 57k, 125s to stop- Kyorlingovyy tsentr "Ledyanoy kub"
Love this? Explore the entire list of places to visit in Adler before you plan your trip. Fancy a good night's sleep after a tiring day? Check out where to stay in Adler and book an accommodation of your choice. How popular is Iceberg Skating Palace? People normally club together Ice Dome Bolshoi Adler and Olimpiyskiy Park while planning their visit to Iceberg Skating Palace. Karmen show is the best activity in Sochi! Здание прекрасно, шоу замечательное. Но если вы приехали раньше, и зашли в Ледовый дворец то посидеть там негде. Ни одной скамейки или стула. Так на ногах и томятся сотни людей в ожидании открытия входов. Это абсолютно не поддаётся логике здравого смысла. И конечно после представления уехать не просто. В огромной неразберихе с выездом с парковки, такси просто не может подъехать, приходится достаточно не близко идти пешком.А к остановке общественного транспорта вообще нет указателей.